One of the most difficult cultural divides that MBS faced was the considerable disparity between the places of women in Western and Chinese culture, which she regarded with considerable frustration. As previously mentioned, MBS had established a strong set of feminist principles by the time she graduated from Bryn Mawr, and honed them further during her employment with suffragist Maude Royden. While she does not seem to have incurred explicit criticism for her bold behavior, her early letters show an acute self-consciousness of her status as a foreign woman—though she was never in the least apologetic. In a letter dated February 1926, only a few months after her emigration, she attended her first dinner in a Chinese home. Many of her comments throughout the missive show how prominently she felt her gender accentuated her foreignness. “I gathered that he and his father were served in another room”, she writes. “I suppose his father would not think of sitting down at the same table with a woman.” Later, “I couldn’t help wondering as I said goodbye to old Mrs. Chi and young Mrs. Chi, and they cordially urged me to come again, what they really thought of a foreign woman who walked around the streets with men, and went wherever she pleased.” She also describes her trepidation while passing through a sitting room in which a number of “typical old school Chinese gentlemen” playing Ma Jongg, worried that they will be irked at the presence of a “foreign woman breaking into their sanctum”. 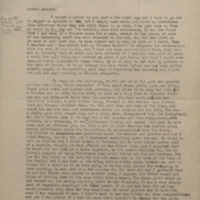 1Letter to Emma Bailey Speer, 18 April 1927. 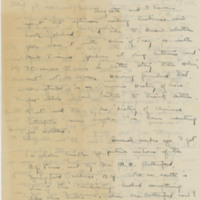 2.Letter to Robert Elliott Speer and Emma Bailey Speer, 30 January 1927. 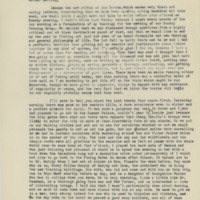 3.Letter to Emma Bailey Speer, 18 April 1927.